Cypress River Plantation is a truly distinctive development on the Intracoastal Waterway in Myrtle Beach. The 500+ acre neighborhood features home sites and custom built homes with spectacular Waterway and lake front views. Cypress River Plantation lots are very large and heavily treed, separating this community from the developments of cookie cutter homes and small home sites. Beautifully landscaped grounds, sparkling lakes, and waterfalls add to the natural beauty of the development. 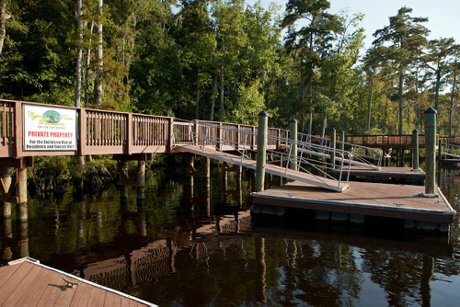 Cypress River Plantation amenities include a community clubhouse, pool, tennis court, playground, private boat storage, community boat dock with gazebo, a 40 acre community lake, and sidewalks on both sides of the street. Cypress River is also associated with a full service marina less than a mile away that offers both wet and dry boat storage. Residents also enjoy easy access to main roads, allowing convenient access to everything they want and need. It is close to the beach, shopping at Coastal Grand Mall, dining, the Myrtle Beach Airport, medical facilities, and more! With plenty of lots still available Cypress River Plantation is a great place to build your dream home today! For additional information about lots or homes for sale in Cypress River Plantation contact Beach Realty Group. If you are looking to sell a home in Cypress River Plantation call us at 843-424-6900 or email us. Also check out Plantation Lakes Homes For Sale in Carolina Forest. Listing courtesy of Weichert REALTORS CF , Monica Riga. Listing courtesy of Sellers Choice Real Estate , Jack Parker. Listing courtesy of Sue Ward Homes Inc , Laura Harrison. Listing courtesy of Realty ONE Group DocksideSouth , Jill Donabauer. Listing courtesy of The Litchfield Co.RE-PrinceCrk , Rosie Morais. Listing courtesy of BHHS Myrtle Beach Real Estate , Tucker Davis.